Regardless of whether or not you have diabetes, eating unlimited amounts of sweets is not the best idea. While you are entitled to a treat from time to time, overeating sweets can lead to soaring blood sugars, stomach aches, weight gain, and unhealthy eating habits. If you think sugar free treats is the answer, think again. 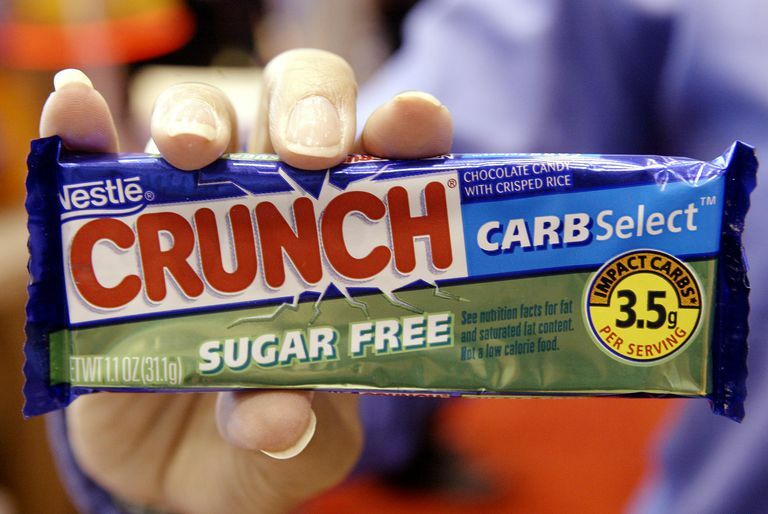 Just because a food is labeled "sugar-free" does not mean it's carbohydrate-free or low-calorie. In fact, the FDA states that foods labeled "sugar-free" should also have a disclaimer that reads "not "low" or "reduced in" calories. Because some of us may think these foods are "diet foods" and overeat them. It is important that we know the truth behind sugar-free products—that is, just because they are sugar-free does not necessarily mean they are healthy or low-calorie. Take "sugar-free" toffee squares, for instance: 3 pieces contain: 210 calories, 16 g of fat, 24 g of carbohydrate and 23 g of sugar alcohols. ~410 calories, 32g fat (half your daily needs), 18g saturated fat (almost a days worth of saturated fat), 48 g of carbohydrate (about 3 slices of bread) and 46 g of sugar alcohols (which can cause gas and diarrhea). Overeating foods with sugar alcohols can also cause a laxative effect - most labels have this claim written on it in the fine print. In simplest terms, carbohydrates are broken down by enzymes to provide the body with glucose or sugar for energy. Most of the carbohydrates found in sugar-free candies come from sugar alcohols, such as maltitol. Although our bodies do not absorb all the calories from maltitol, they do absorb some. This means that your blood sugars can still go up when eating sugar-free products—especially if you are overeating them. Every individual is different, most people with diabetes, do best by eating a real treat made without sugar alcohols or sugar substitutes. Savor each bite and count it into your meal plan and aim to move a bit more when you know you are going to splurge. Physical activity helps to utilize insulin and burn up excess sugar. When choosing treats, avoid plain sugary candies such as sour candies, taffy, and licorice as they can contain no fat or protein and can spike blood sugars rapidly. 1 oz 75-90% dark chocolate: ~ 170 calories, 12 g fat, 7 g saturated fat, 7 g sugar, 2 g protein. Melt the chocolate and dip strawberries for added fiber benefit. 1/2 cup of vanilla ice cream: ~150 calories, 7 g fat, 5 g saturated fat, 15 g carbohydrate, 15 g sugar, and 2 g protein. Top it with 1/2 cup fresh fruit and a tablespoon of chopped nuts for added fiber and protein boost. 2 peanut butter cups: ~ 210 calories, 13 g fat, 4.5 g saturated fat, 24 g carbohydrate, 24 g sugar, 5 g protein.